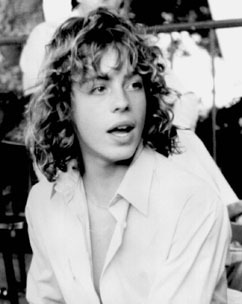 Leif Garrett was born and raised in Hollywood. His mother was a sometimes-actress who had bit parts in The Love God? with Don Knotts and TV shows from The Brady Bunch to Knots Landing. His father was a stuntman and cameraman who occasionally worked as an actor. His sister, Dawn Lyn, was also a child actress, best remembered as Fred MacMurray's stepdaughter in the last three seasons of My Three Sons. At kindergarten age Leif Garrett was playing Dyan Cannon's son in the wife-swapping comedy Bob & Carol & Ted & Alice. He had "cute kid" roles in several other movies, including Max Baer, Jr.'s drive-in classic Macon County Line and the original Walking Tall. On TV, you can spot the prepubescent Garrett on reruns of Family Affair, Gunsmoke, and Nanny and the Professor. After his voice changed, Garrett was remolded into a bubble-gum pop singer. His hits included a 1977 cover of The Beach Boys' "Surfin' USA" and a 1979 Top Ten rendition of "I Was Made for Dancin'". As a teen actor, he starred in Skateboard, and he played Kristy McNichol's boyfriend on a very special episode of Family -- she considered surrendering her virginity to him, but decided against it. Tragically, in 1979, Garrett was driving when his Porsche rear-ended another vehicle and plunged down a hillside, leaving his passenger and then-best friend Roland Winkler paralyzed for life. In the aftermath of the accident, Garrett's career dried up. He had a brief comeback with a supporting role in Francis Ford Coppola's The Outsiders (1983), though for the most part Garrett's work as a young adult was typified more by the slasher film Cheerleader Camp and The Road to Freedom, a Scientology-backed musical tribute to L. Ron Hubbard. In later years, Garrett's films have included such oddities as Dickie Roberts: Former Child Star and Ed Wood's posthumous I Woke Up Early the Day I Died. He has fronted numerous low-profile rock bands, including The Crush-Ups, F8, and Godspeed; the latter toured with The Melvins in 2000. He also sang Christian rock with Liberty n' Justice. In 1998, the corporate descendant of Garrett's original recording label released a "greatest hits" compilation of his music, The Leif Garrett Collection. Garrett has said that the only payment he received was a few copies of the CD. In 1999, Garrett was featured on VH1's Behind the Music, where through glassy eyes and oddly-stilted words he declared himself drug-free, and was awkwardly reunited with the wheelchair-bound Winkler. Later that year, Garrett was arrested after trying to buy drugs from undercover cops near L.A.'s famous MacArthur Park. Two years later he declared bankruptcy, and court papers revealed that his only steady source of income was a $1,000 per month allowance from his mother. In 2005, he was arrested on drug charges, and bargained a plea down to "attempted possession of cocaine-based narcotics". He was assigned probation. In 2006, he was caught riding the Los Angeles subway without a ticket and arrested for fare evasion and, after a pat-down, possession of heroin. He subsequently failed a court-ordered drug test, and was then jailed when he walked away from a live-in drug treatment program. In 2010, he was charged with possession of heroin. According to publications authored by the Scientology organization itself, between 1988 to 1992, Garrett completed the following rundowns: Celebrity courses 220 (Purification), 226 (Conditions in Life), 228 (Purification), 252 (Purification), and 256 (Qualified Scientologist).